If you’ve ever caught old episodes of the 1960s TV shows “The Andy Griffith Show” or “Gomer Pyle, U.S.M.C” chances are you’re familiar with the character Duke Slater, played by Ronnie Schell. At that time, Schell was all over TV. He had roles in “Good Morning, World,” “Rowan & Martin’s Laugh-In,” “That Girl” and “The Jim Nabors Hour.” He appeared in TV commercials, voiced Hanna-Barbera cartoons, had a long-running career in stand-up comedy and is notable for being the oldest comedian to perform annually in Las Vegas and Lake Tahoe. But before all that, Schell was a drama student at San Francisco State University, graduating in 1958 with a degree in liberal studies. Once an aspiring professional baseball player who played semi-pro ball, Schell maintained his appreciation for the sport while at SF State and long after. From 1998 to 2010 Schell hosted a series of comedy nights benefiting SF State’s Athletic Scholarship Program. Schell recently was honored for his dedication to Gator athletics with the installation of a plaque inside the University’s gym. He participated in the unveiling before attending the University’s annual Student-Athletes Awards Banquet, where he was recognized for his service to the University. In between, he spared a few minutes to talk about his career. How did you get your start in show business? I was in a couple of plays at SF State. One summer, we were doing a play called “Room Service,” and I got an offer to appear at the San Francisco comedy club the Purple Onion. I said I couldn’t do the play anymore, which infuriated the head of the drama department, J. Fenton McKenna, but later we became friends. I signed on at the Purple Onion for two weeks and I ended up staying for five months. The other acts were Phyllis Diller and the Kingston Trio. They were just getting their start. I finished college, and the Kingston Trio offered me a job as their opening act. At that time they were really hot and were traveling to colleges across the country. After that, I went back to the Purple Onion and then to the hungry i, which was a step up in show business. In 1962, my manager said, “You’ve got to move to Los Angeles because that’s where the action is.” I didn’t want to leave the Bay Area, but I did, and I started doing “Gomer Pyle, U.S.M.C.” in 1964. Do you have any favorite anecdotes from your early days in television? I stared on a show called “Good Morning, World” about two disc jockeys, and my co-star was Goldie Hawn. Goldie was a go-go dancer out of Baltimore. She was discovered after she appeared on “The Andy Griffith Show” and some executive said, “Gosh, she’s great.” So they put her on the sitcom with me. Every night we rehearsed in my apartment. She would get tired and say, “I don’t want to overdo it.” And one night I said, “Goldie, you’re not going to make it because you don’t have discipline. You give up before you even start.” Two years, later she won the Academy Award for Best Supporting Actress for the film “Cactus Flower.” I found this out while I was working in a toilet bowl in Omaha. You’ve worked in TV, starred in movies, done commercials and performed stand-up. What’s been your favorite gig and why? I was really hot when I was a stand-up comedian. I miss being on late-night TV the most. I was watching David Letterman with my wife and I saw a friend of mine do stand-up on the show. I said to my wife, “You know, I’d like to do that again.” She turned to me and said, “Ronnie, you’ve had your turn.” It hit home with me. I’ve had my turn and I don’t need it anymore. 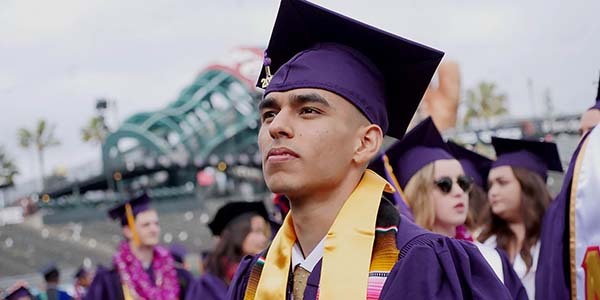 How has SF State influenced your life and career? I probably wouldn’t have been an actor if it weren’t for the drama department at SF State. A couple of the instructors, including Jules Irving, were influential. Irving taught me to react instead of act. How has show business changed over the years? In 1958, there were about 200 comedians throughout the world. Today, every other person is a comedian. They are running thin with material, and you can get away with a lot more in the area of profanity. Every other person working as a bartender or waiter in Hollywood is an actor. What advice do you have for students pursuing careers in the entertainment industry? Good luck. Get an avocation or something to fall back on because it’s really tough today. It’s a game of luck. There are thousands of comedians who are funny, but they didn’t get a break. I didn’t get the big break, but I got many little breaks.